Coppery orange and black monarch butterflies glow against the warm, late summer sun. Monarch migration to Mexico is underway in the northern United States. According to monarchwatch.org’s peak migration chart, at 45° latitude the greatest number of monarchs will migrate between August 29 and September 10. In St. Paul, Minnesota, I’ve primarily seen the butterflies floating beneath trees in backyards and along the streets. A few rest in our garden and nectar on garden phlox, goldenrod, snakeroot, Japanese anemones, black-eyed Susan’s and Joe-Pye weed, which appears to be their favorite. 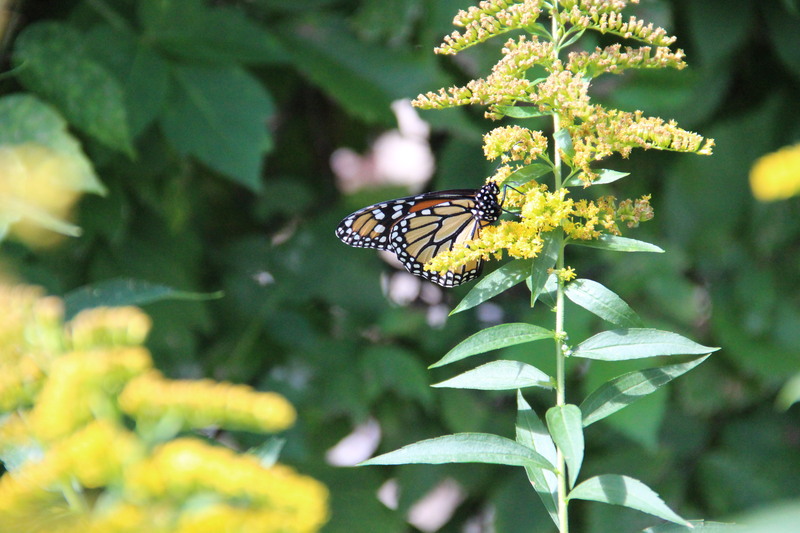 A monarch rests on one of more than 40 species of goldenrod (Solidago) native to Minnesota. 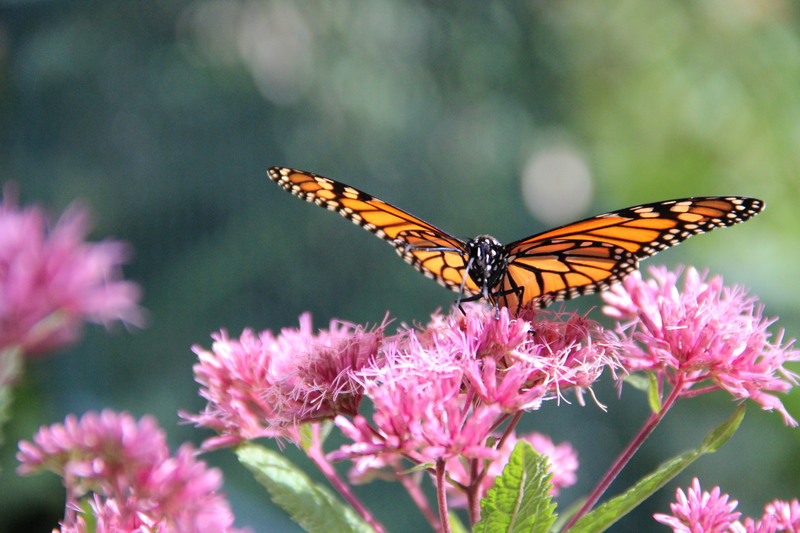 A female monarch drinks nectar from sweet Joe-Pye weed (Eutrochium dubium). Will this year’s migration numbers be higher or lower than 2014’s? It’s easy to help scientists track the data by contributing your own monarch migration observations. 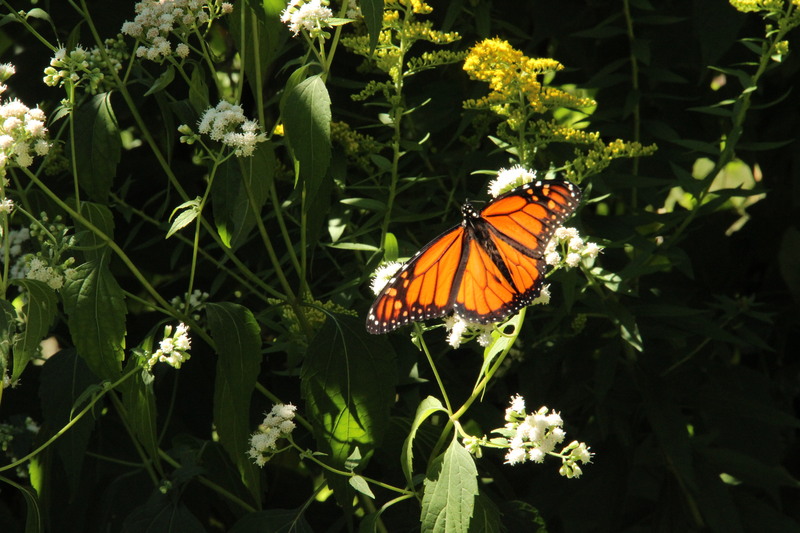 Visit learner.org’s Fall 2015 Migration Report Page and complete the short information form for monarchs. Or, if you’re just interested in how 2015 fall migration is progressing, you can check out the latest information on their Fall 2015 Maps and Sightings page. This entry was posted in Butterflies, Insects, Nature Photography, Saint Paul, MN and tagged Fall 2015 monarch migration. Bookmark the permalink. Fantastic photos and fun to see these beautiful creatures. They are present here in CA right now too on their way south. Hi Janet, thanks for your note about monarch migration in California. I would love to see the monarchs in their winter home someday!